Tune-ups are essential engine maintenance for any vehicle, whether you drive a coup or diesel truck. At Certified Automotive Repair, we are the best shop for a tune-up Salem, OR has to offer. Our ASE Certified mechanics are trusted and equipped to inspect, run diagnostics, and make any repairs necessary to the safe function of your vehicle. A vehicle that receives regular maintenance will operate its maximum performance level through the years. Engine tune-ups involve the inspection and testing of your engine’s many components: spark plugs, wires, oil and oil filters, fuel filters, gaskets, and more. Scheduling tune-ups at regular intervals will not only guarantee your engine is running efficiently and reliably, but will also extend the life and performance of your vehicle as you add more miles to the odometer. At Certified Automotive, we know how important preventative maintenance is to a car or diesel engine. That’s why we place heavy emphasis on engine tune-ups. Our technicians look for signs of wear and tear that can prevent breakdowns from happening later down the road. Plus, our job is to extend the life of your vehicle. For every make and model of vehicle, there’s also a different maintenance schedule. 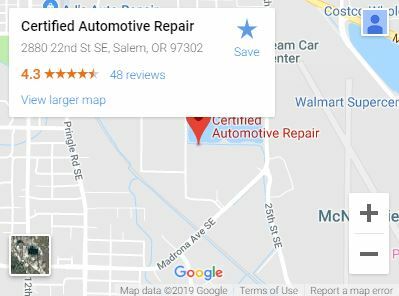 When you call our automotive repair shop in Salem, OR, we make sure to set your car or truck up with the most beneficial tune-up schedule. Come Into Our Shop Today For A Free Inspection and Estimate!